Our collection has been quietly improving since our last update. Thanks to the Brown County Courthouse, Northern State University and the Alexander Mitchell Public Library, we’ve added quite a few more items to site. One of the more interesting developments has been the creation of our Historical Maps Exhibit. In this exhibit, some of the maps from the collection are presented over current street maps and satellite imagery. You can fade between the overlaid map and the current imagery to compare changes over time. In addition, each page has links to the original documents as well as a link to view the map within Google Earth. 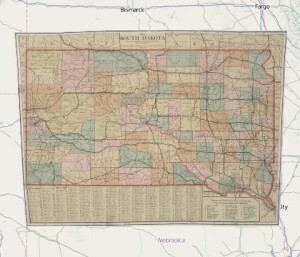 Highway map of SD in 1919. Of particular interest, the Sanborn maps of Aberdeen have been stitched together so you can see the details included in pages of those maps (see the pic below). At magnified zoom levels, you can see the detail of the street and building information of those maps. And in this format you don’t need to jump from page to page to see it in context. View down to the streets and buildings. Take a look around, and let us know what you think. 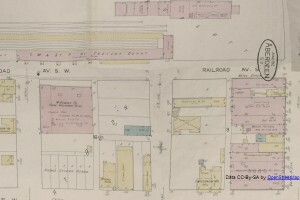 If you have any historical maps that you think would make good additions to the project, contact us.